A-Track for Windows (A-Track) is a powerful FREE extension to complement the facilities of your NCE Corporation Power Cab or Power Pro Digital Command Control system and to assist you in running your roster of locomotives on your model railroad. A-Track allows you to store full details of all of your locomotives and accessory (turnout) decoders, with all of their DCC configuration parameters, in a readily-accessible format on a personal computer - but without requiring you to be any kind of computer expert. A-Track's back-up copy of all of the data held within each DCC decoder fitted in the locomotives which make up your roster, safeguards all the hours of effort put in by you (or your Club's DCC expert) in programming and configuration. When linked to your NCE system, A-Track does not alter the way in which the NCE Command Station and Handheld Cabs operate, or are connected to the track and to each other, in any respect, so that you can continue to use them exactly as before - but with A-Track available to lend a powerful helping hand in the background. When used with either an NCE Power Pro, a Power Cab or Smart Booster Version 1.65 system, or a DCC Twin (all except the Power Pro with a Version 7 USB Interface), as well as looking after the contents of your DCC decoders, A Track will also let you monitor, set up, save, and restore the complete status and operational parameters of the NCE Command Station and all attached Cabs from your PC. This frees you from the task of having to set everything up from scratch at the start of a session, and leaves you with more time to enjoy your model railroading. If you are using a DCC Twin, A-Track lets you perform these functions without requiring to you to purchase an NCE ProCab for this purpose. Note, however, that these set-up facilities are not available when A-Track is used with the earlier Version 1.28 of the NCE Power Cab and Smart Booster systems, or with a Version 6 USB Interface. Using A-Track, you can read and save the status and parameters of each new locomotive decoder as delivered by the manufacturer. You will then be able to see the complete configuration details of the locomotive at a glance, on the PC screen, rather than only being able to check one parameter at a time by using a standard handheld Cab. 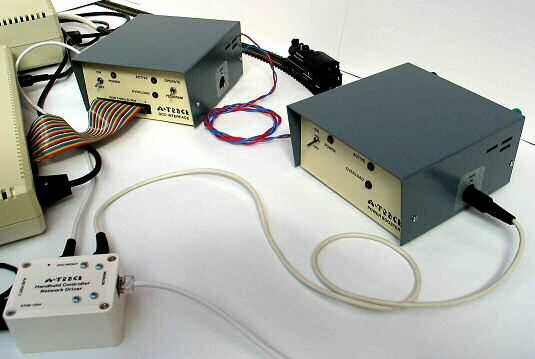 A-Track can handle all types of decoders, including sound decoders, from all manufacturers who comply with National Model Railroad Association (NMRA) DCC standards. Currently, the system has been successfully tested with Bachmann, Broadway Limited (Paragon 2/3), DCC Concepts, Digitrax, ESU (LokSound), Hornby, Lenz, NCE, Model Rectifier, MTH, QSI (Quantum), SoundTraxx, Tam Valley Depot, Train Control Systems (TCS), Zimo, and ZTC decoders. A-Track gives you total control over decoder programming and locomotive tuning. You can make changes to the decoder parameters directly, without having to compute or type in complicated numerical values, then immediately try out the effects, and decide whether to keep the alterations or go back to the original values. Being able to keep back-up copies of each decoder's settings is especially valuable if you make an error in programming one or more parameters, and completely upset your careful tailoring of a locomotive's performance and characteristics. A-Track will allow you to retrieve the previous decoder set-up and restore the locomotive to the state it was in before your inadvertent mistake (as long as you remembered to save the earlier version before making the changes !). Because A-Track lets you look at the decoder set-ups for several locomotives at the same time, and see the differences between them, it is relatively simple to tune the speed (and function) characteristics of these locomotives to run together in a consist. You can then run the locomotives individually, or together in the consist, on the track directly from the PC screen in order to check out the results, returning to the programming function if necessary to complete any fine tuning. Whenever you purchase a new locomotive which is similar to one already in your roster, you can save a lot of programming time and effort by using A-Track to copy the decoder parameters from the configured locomotive to the new one - after making a back-up copy of the original settings in the new locomotive, of course (just in case !). Programming of the new locomotive is then reduced to giving it an appropriate description and a unique DCC address, together with any minor extra enhancements that you might want to make. As well as handling locomotive decoders, A-Track also allows you to program and operate accessory (or stationary) decoders which are used primarily for the control of turnouts on your layout. From these panels you can control the setting of any turnout via the click of a mouse, with the commanded position shown immediately on the screen display. 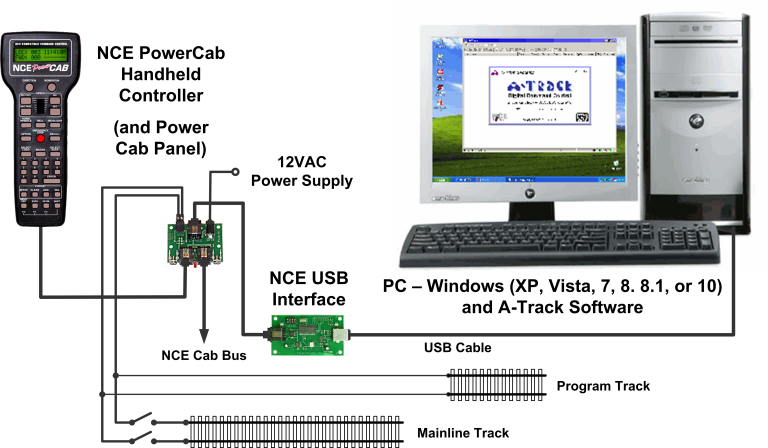 Additionally, if you have either an NCE Power Pro or a Version 1.65 Power Cab system, and wire up your turnouts to one or more NCE Auxiliary Input Units (AIUs) attached to your NCE system's Cab Bus, A-Track will be able to sense the actual position of each turnout and so verify that the intended route is set correctly before you run a locomotive into that section of the layout. Rather than set each turnout individually for a specific route, A-Track gives you the choice of selecting the start and end points of a required route (plus an optional mid-point) and will then figure out the necessary intermediate turnout settings automatically. All turnouts can then be switched with a single click. The turnout settings for the found route can also be saved as a Macro - a set of turnout operating commands - for future use. Both NCE Power Pro and all versions of Power Cab systems support the definition and use of Macros, and A-Track gives you the capability to expand the rather limited Macro facilities of the Power Cab systems to equal those of Power Pro systems. With NCE Power Pro and Version 1.65 Power Cab systems, A-Track gives you full access to the Command Station, and hence the ability to display all of the key parameters stored in its internal memory on the PC screen. This allows you to perform Command Station and Handheld Cab setup directly from the computer, changing parameters to suit your immediate requirements, and to define and manipulate the composition of Consists and any stored Macros. All parameters stored in the Command Station memory (System, Macros, Consists, and Cab Status) can be selectively saved (backed-up) to files on the PC's hard disk, or on CD-R / DVD-R or a USB flash drive (memory stick), and then recalled at any future time to restore the Command Station and its attached Cabs to a state corresponding to a previously-recorded operating session. Similarly, A-Track allows all or part of the equipment roster to be saved to files, on any of the media listed above, simply for safe-keeping or for loading into another A-Track / NCE system elsewhere. Sets of CV values can be copied from one decoder to another, which can significantly reduce the time to program and set up a new locomotive added to your roster. Given the current size of hard disks and the amount of RAM fitted in a modern personal computer, there is no practical limit to the number of different Command Station or Cab setups which can be saved to, or restored from, the computer's permanent or removable storage, and A-Track can handle equipment roster lists stretching to hundreds (or even thousands) of equipment items. However, such large lists tend to be unwieldy to view and manipulate, so it is usually easier to compile shorter rosters - corresponding, for example, to an operating session - using the facilities available in A-Track. 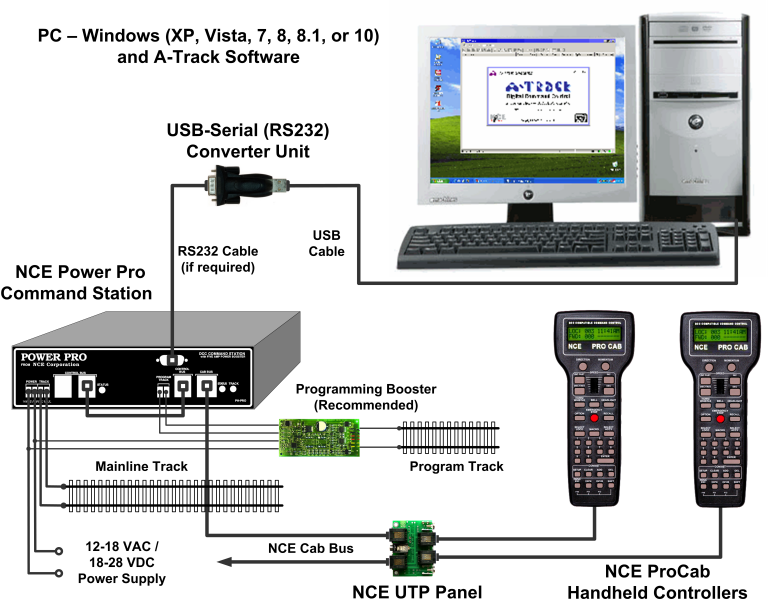 As well as its primary purpose of storing and manipulating the contents of DCC decoders, A-Track also allows you to control any selected locomotive or set of turnouts on the Main Track directly from the PC, using the mouse and a "soft" on-screen controller, by issuing DCC commands directly to the NCE Command Station. Although this control function is really intended as a test facility, to check the results of programming a locomotive decoder, for example, you can call up and operate as many as eight "soft" controllers on the screen simultaneously - if you think you possess the capability and dexterity to run eight locomotives simultaneously on the layout by yourself ! A-Track may be downloaded completely free of charge for your personal or club use - see Get A-TRACK for details. Once installed, you have the option of registering your copy of A-Track, also without any charge, in order to have priority with regard to support and assistance in rectifying any problems which you may come across. Please note that the term "completely free of charge" must not be confused with "free for you to exploit as you wish". A-Track is copyrighted software, and not a public domain product. You may not distribute or sell A-Track either alone or as part of any commercial item, as set out in detail in the terms of the A-Track licence. If, after using A-Track, you think that it is of benefit to your model railroading activities, and would like to support future A-Track development and enhancements, then you are welcome to make a voluntary donation - but you will not be "nagged" or pressured to do so. Further pictures of the various items of A-TRACK Atari hardware, together with some screenshots showing the Atari A-TRACK in operation, can be found in files on the Download page. A-TRACK is a program originally developed for the (aged but venerable) Atari XL/XE range of computers which implements the Digital Command Control (DCC) system for the operation of model railroads. It has now been fully converted to run under any version of Windows from XP upwards. A-TRACK supports the full range of features defined in the DCC Standards and Recommended Practices issued by the National Model Railroad Association and, with the addition of a hardware interface box (the DCC Interface Unit or DIU) to link the computer to the track, and a set of handheld controllers plugged into a network of sockets wired around your layout, will let you operate up to eight locomotives on the track at the same time. A-TRACK provides total control over a model railroad layout from your Atari computer keyboard, allowing you to set up a roster of locomotives for an operating session, allocate locos to consists and to selected handheld controllers, and even to operate all turnouts or signals from a central location. A-TRACK also incorporates full programming facilities for the decoders in the locomotives, and can save all details of the set-up for each locomotive, and the operating session, to disk for safekeeping and use at future sessions. DCC allows the simultaneous operation of almost any number of model locomotives on complex track layouts without the use of conventional block switching, ie. each locomotive does not have to be controlled within a single section of track allocated specifically to it. The speed and direction of each locomotive can be set independently regardless of where it is on the track (a feature, naturally, which has to be used with care !). Control can also be exercised over multiple locomotives treated as a single unit (MUs or consists) and over accessories such as lighting, signalling, and points (turnouts). The same decoders fitted to locomotives can be used to control static trackside accessories such as signals and turnouts. However, specialised accessory decoders with multiple switched outputs are normally employed for this purpose unless, of course, the accessory (a turntable or crane, for example) requires control of an electric motor. A-TRACK and the DIU are designed to be fully compliant with NMRA Standards and to work with all makes of commercial decoder. During the period of operation, the system was successfully tested with Digitrax, Lenz, Model Rectifier, North Coast Engineering (NCE), Wangrow SystemOne (now ceased trading), and ZTC decoders. In the Jan/Feb 1996 issue of Atari Classics magazine there was an appeal from an enthusiast in California, one Decker McAllister, for some help in designing an interface from an Atari 8-Bit home computer to control model railways using the Digital Command Control system - since neither he nor his colleagues had the necessary electronics or assembler code skills. Yours truly volunteered to assist, and then spent virtually all my free time over the next four years designing first the hardware (the easy bit - I'm an electronics engineer by profession) and then the software. Because of the need to function and control locomotives in real time, the use of Basic was out of the question, and all software was written in Assembler code. The source listing stretches to over 15,000 lines of code (around 200 pages). I think it must be one of the biggest assembler programs ever written for the Atari Classic (the Atari 400/800 Operating System runs to 5800 lines). To ease operation, the software also includes a handler to allow use of a mouse - although a normal peripheral on PCs, a mouse was never supported by Atari Classic operating systems. Mice intended for either the Atari ST or the Commodore Amiga can be connected to a joystick port, although it is not possible to connect up a Serial or PS/2 mouse intended for PC use. Less than 250 lines of Assembler are required to implement a general-purpose mouse handler which can then be incorporated in the standard Atari CIO system and, hence, made accessible to any application program written in Basic or machine code. After nearly two years of work (and considerably beyond my initial estimates) the first demonstration version of the software, was delivered to Decker and his colleague Bob DeMoss in Long Beach, California and to Charles Cole of the Cochise & Western Model Railroad Club in Sierra Vista, Arizona (co-opted into the project by Decker) just before Christmas 1997 for evaluation. Much to my relief it ran perfectly on the NTSC (USA) versions of the Atari Classic - since the software involves a lot of critical timing routines I was worried that changing to 60Hz screen frame rate from the normal PAL (UK) 50Hz rate would disrupt operations. However, it took another full year of work to complete the design of the interface electronics, to bring them into line with the needs of the software, and then to build sets of equipment for delivery to my patient 'customers' in California and Arizona. First deliveries were made in Spring, 1999 and followed up by personal visits to the installations to set them up fully, and to iron out the inevitable teething troubles. There was yet another year of development to produce final versions of the plug-in, walk-around handheld controllers to complete the A-TRACK system, together with associated software upgrades, but final delivery was achieved in March 2000. The largest installation, at the C&WMRRC was in continuous operation, with only minor (and easily rectified) glitches, since then right up until late 2007. During this period of successful operation, it became clear that the limit of 64 locomotives in the A-TRACK roster was a serious limitation for club operations, being unable to accommodate all the locos belonging to the members. A-TRACK could not easily be expanded to hold a larger roster since the program already used all but a few hundred bytes of the available standard Atari 64Kbyte memory. The solution was to write a companion program, A-STILE, which allows all the club's locomotives to be handled in a single file, and selected rosters of up to 64 locos to be transferred to A-TRACK for specific operating sessions. Further details of A-STILE can be found on the Projects page. Sadly, although Decker Mcallister had seen the initial successful installation, he passed away in late 1999 following a short illness. Decker's boundless enthusiasm sustained the project throughout its lengthy development, and ensured that it does what model railroaders want - without them having to be computer experts. A-TRACK is dedicated to his memory. Production of the software for A-TRACK would have been almost impossible without the use of the excellent SIO2PC file transfer software produced by Nick Kennedy to connect my Atari 800XL to a PC. 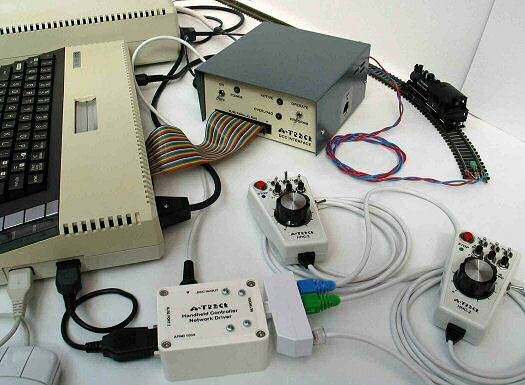 The actual connection is made through an RS232 interface, built around a Maxim MAX232 chip, connected between the Atari SIO port and any serial port on the PC. The interface is relatively easy to construct following the clear documentation provided by Nick. Once connected, the SIO2PC software running on the PC turns the PC into a set of 'super' Atari disk drives which can be handled under any Atari DOS system without any modifications to the Atari hardware, and without any additional software running on the Atari machine. Atari files can be stored on the PC hard drive or transferred to PC floppy disks, so you can have your complete Atari library almost instantly to hand. Using SpartaDOS (my preferred operating system for the Atari Classic) it is possible to set up these 'super' disks on the PC with a capacity of 1MB - which was essential for the A-TRACK project where the source files amount to around 500KB and the Assembler list file alone occupies in excess of 650KB. I have to admit that files of this size are totally beyond the capabilities of any of the Atari text editors, so I actually used the PC to generate and edit all of the Assembler source code. This was then transferred to the Atari 800XL via an RS232 comms link, using a P:R: Connection and BobTerm at the Atari end to handle the communications. BobTerm, written by Bob Puff of CSS, is by far the best comms program for the Atari Classic machines and translates the PC's CR/LF ASCII characters to Atari 'End-of-Line' characters 'on the fly'. After a little more manipulation on the 800XL, the translated source file (held on an SIO2PC 'super' disk in the PC) can then be accessed by the Assembler/Editor cartridge and assembled to produce the required machine-code object program and the output list file. These are output directly to another SIO2PC 'super' disk file on the PC, since there is no way the very large files involved could be held within the 800XL's 64 KByte memory, or on a real Atari disk drive. Although it all sounds very complex, it is relatively easy to use in practice - and very satisfying to utilise the PC as an Atari peripheral ! Unfortunately, the Atari 8-bit machines became obsolete a long time ago with the relentless march of the IBM PC, so the future of A-TRACK lay in converting it to run on a PC under Windows. The initial intention, at least, was to retain as much of the A-TRACK hardware as possible, including the DCC Interface Unit (DIU) and the handheld controllers, so there would be no changes required to the model railroad layouts where it is currently employed. To make things as simple as possible for myself, the software was written using Visual Basic (VB6), and the interface between the PC and the DIU (and the handheld controllers) would be via USB. Utilising USB means that the host PC must run Windows XP as a minimum, but this should not present too much of a restriction in today's PC-oriented world. 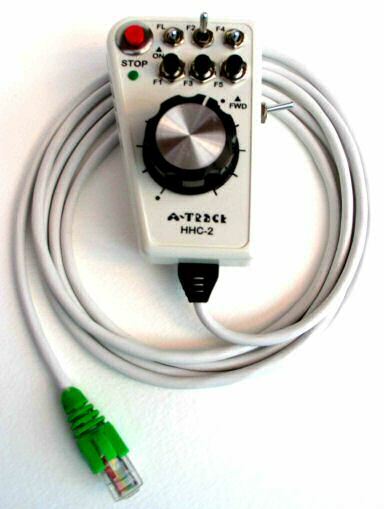 A custom A-TRACK USB interface based around a Microchip PIC microcontroller - one of the range of devices which support a full-speed USB interface - was also developed as part of the initial conversion. However, over time, it became clear that attempting to retain (and support) all of the original hardware was not the best of ideas, and a decision was made to interface A-TRACK to commercial DCC hardware. The NCE Power Pro range was selected as the easiest to handle, and development proceeded. Subsequently, a fully-operational system with hardware interface and application software was installed in August, 2008 at the Cochise & Western Model Railroad Club in Sierra Vista, Arizona without any major problems. A-TRACK features continue to be enhanced, including the ability to operate with any commercial USB-to-Serial converter unit, and the system has now been fully released through this website for the use of anyone with an NCE DCC system.